Ketchikan, Alaska - A recent news item in the Anchorage daily paper mentioned that a group of Juneau boosters, chaired by Mayor Bruce Botelho, hope to build a new Alaska Capitol building to be leased to the state at completion. They call themselves the Capitol Planning Commission and expect to announce a nationwide design competition in November. A new Capitol building would replace Juneau's present six-story Art Deco treasure. The old six-story building, its imposing façade featuring four gracious marble columns quarried in Southeastern Alaska, is a stately structure matching the grandeur of the setting that is home to picturesque downtown Juneau. But the still sturdy and timelessly elegant 75-year-old building obviously needs renovated and perhaps put to another use. Before that happens, there definitely is a need for a new Capitol to replace it. The historic building's age and shortcomings could very well be used as the target and political banner waved for yet another capital move effort by Anchorage area interests. But that's politics and this is a story of a building and of the region its marble adornments came from. 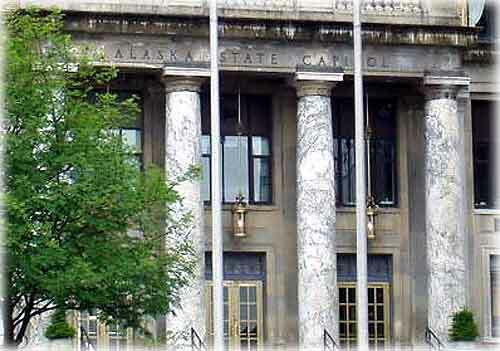 Alaska's Capitol building was designed and built in 1929-30 for a legislative body of only eight senators and 16 representatives who met every other year for 60 days. In those days only the third floor was occupied by the offices of the territorial governor, the lieutenant governor (called the Secretary of Alaska back then) plus the territorial auditor, treasurer and highways engineer ­ and the legislative chambers! Legislators back then ­ and even until the oil boom ­ didn't have staff, much less offices in the Capitol! The rest of the brand new building provided space for the Alaska Communications System in the basement, a stylish new post office on the first floor, and the museum shared the second floor with a variety of federal offices. The third floor, as mentioned, was devoted to the territory. The upper stories were for more federal offices, the U.S. District Court, offices of the U.S. Attorney, Marshal and so forth. Because of all that, the Alaska State Capitol was called, in its early years, simply "the federal building" ­ leading those who came along later to believe it was built just as an office building, not the stately capitol that it was and is. In the year 2004, the 75-year-old structure is overcrowded with just our present 20 state senators and 40 state representatives, their offices and staff offices, meeting and other rooms. The Legislature now meets for a 120-day session every year. Because of all these needs, the original large rooms have been made into several small rooms that have lost, in all the remodeling, the lovely woodwork and trim of the original building. The present Capitol also lacks a number of things necessary to modern comfort, including not only simple elbow room, but wiring and dependable heat and air-conditioning - not to mention adequate parking. Our old Capitol building also has an amusing early history, a typical tale of ups and downs solved by pioneer ingenuity. The U.S. Congress made the initial appropriation for the Capitol building back in 1911, just days before Territorial status was conferred in 1912. 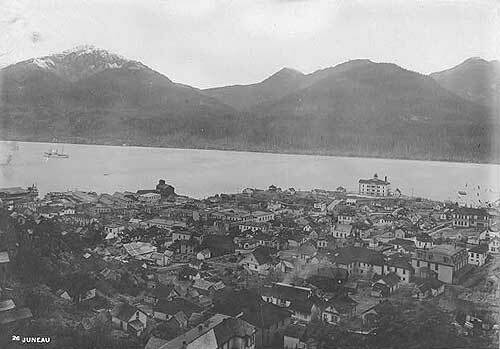 Juneau, its downtown crowded on a slope under the backdrop of a giant mountainside, was a small town of just 4,000 souls then. The first step in gaining a capitol building was to buy a lot on which to build it. The federal government, however, refused to pay what it considered the exorbitant prices wanted by Juneau property owners! Offers, counter offers and periods of stony silence went on until the outbreak of World War I, which caused a further delay of several years. 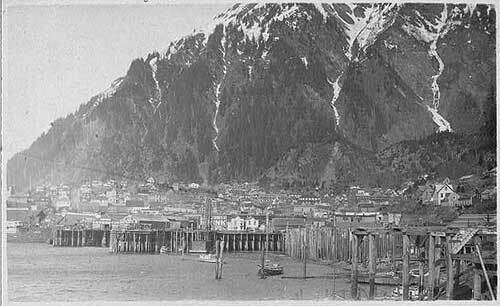 In the 1920s the people of Juneau, past impatient, were getting disgusted! Once again a landowner refused to lower his price for a lot, so the people of Juneau managed to raise the money themselves ­ and the lot was purchased! Construction began in 1929.
were well aware of the Territory's wealth of minerals of all kinds ­ they were prospectors themselves. When the plans for the new capitol/office building came up, it was only natural that they wanted Alaska's marble included in the design. By that time there were at least 70 major buildings across the nation adorned by Alaska's lovely stone, said to equal that produced in Carrara, Italy. Gold seekers had found it. As the Gold Rush stretched into the opening years of the 20th Century, prospectors scoured not only the mainland portions of Alaska but the Southeastern mainland and islands of the Alexander Archipelago as well. Prince of Wales Island, the southernmost in the chain, is also the largest! It is the third largest island under the Stars and Stripes after Hawaii and Kodiak. It encompasses 2,231 square miles and 1,427,659 acres, with a shoreline of 990.1 miles! As early as 1899 the Vermont Marble Co. in far-off New England began getting letters from Alaska prospectors who told of mountains of marble, with the information that the stone was near shipping lanes and less than a thousand miles from Seattle. A Vermont Marble Co. report of 1905 states, "Letters, of course, were very vague and indefinite and contained no reliable information. They all spoke of mountains of marble, quantity beyond calculation and a quality to which no other marble in the world was superior." Time proved that there are indeed mountains of marble on Prince of Wales Island, and the marble is indeed of superior quality and color! Marble comes from the shells and exoskeletons of marine animals, deposited in limestone, buried by other sediment and then melted, usually by the heat of volcanic intrusions, and then solidified. The characteristic swirls and veins of marble varieties are due to various mineral impurities. There are marble deposits throughout Southeastern. The state's Department of Natural Resources reports that 56 deposits of limestone and marble occur adjacent to the coasts of the islands of Southeastern Alaska. There is even an entire island of marble called, appropriately, Marble Island; there reportedly are hundreds of huge blocks still lying on the island, left from the days of active quarrying. In some locations there are reported to be ancient petroglyphs carved into the marble deposits. The first marble ever quarried in Alaska is said to have come from Ham Island near Wrangell before the turn of the 20th Century. The Stikine Tlingits carved tombstones from the lovely stone. Not too many years ago there was a small carved marble gravestone/totem standing in the side yard of the old two-story Saxman house that sat just off the highway. Revillagigedo Island, on which Ketchikan is located, has marble deposits, too. Pilots remember noticing gleaming white logging roads paved with crushed marble winding through the south end of the island, roads that were soon hidden when the quickly-recovering rain forest covered the scars. In the Ketchikan library there is filed an old ledger of the Vermont Marble Co. titled "Record of Vermont Marble Company's Interest in Alaska up to and Including 1915." The ledger includes reports of exploration, site data, competitor activity and correspondence from a ten-year period of activity. The information indicates that Vermont Marble Co. did not doubt the presence of marble in Alaska, but moved slowly to gain information before investing in any operation. The notes also mention sketchy facts about two small companies already in the field. On Marble Island ­ also sometimes called Fox Island ­ was a producing marble quarry that had begun operation sometime before 1905. It had been prospected and run by a Mr. Fox and one of his partners, a Mr. Ball. Another small company called Great American, in an ownership dispute, sent a Mr. Deppe to re-stake the claim. In early Alaska fashion, Ball shot Deppe - and was sentenced to twelve years in prison! Whether or not this incident had anything to do with it, in 1905 the Vermont Marble Co. ­ which had someone going out to the Pacific Coast anyway ­ instructed G.C. Robinson to head north to Alaska and look over Prince of Wales marble possibilities. Robinson set sail that autumn on the vessel Dolphin out of Seattle, headed for Wrangell. Robinson was at first disconcerted by being sold a ticket only as far as Ketchikan, being told that the ship called only at Ketchikan and then Juneau. He and other passengers are said to have persuaded the captain to stop at Wrangell as well. There he engaged a small gas boat for the crossing to Prince of Wales. It was October of 1905, bad weather and high seas. His report, included in the old company ledger, dryly suggests that any future trips be made in the summer and in larger boats! Robinson's first stop was at Calder, where Alaska Mining employed 18 men. Calder's supply center was nearby Shakan, a cannery and sawmill town of 150 souls at the time. He reported excellent quarry equipment, a sturdy dock and an experienced supervisor who had previously worked for Vermont Marble Co.! Robinson also reported that there was indeed a mountain of marble running a couple of miles alongshore and rising to the tops of 3500-foot mountains! Historical note: That Calder operation shut down in 1910, but the quarry was reopened in 1926 long enough to quarry the stone to be used in the Washington State Capitol Building! After leaving Calder, Robinson traveled to the El Capitan operation some nine miles to the southwest and reported that ocean liners probably could not access the area. From there he went to Marble (or Fox) Island, estimating the excellent marble deposits there to be to be five to six miles long and two to three miles wide. It was on Marble Island that Vermont Marble Co. finally began to build in 1909, working with Mr. Fox. A post office was established and named Tokeen after a nearby Bay. Laborers made $2 a day, equal to $41 in today's dollars, and operators made $3 a day, $61 today, plus board. In 1913 darker deposits were found, prized for trim, and by 1914 there were 70 to 110 men employed there! Their Tokeen camp boasted bunkhouse reading rooms and three bathrooms! The old Vermont Marble Co. ledger entries ended in 1915. War was brewing in Europe, and wars always halt mining operations. And then, after World War I, architectural styles changed greatly. Marble fell out of fashion and architects chose concrete as their building material for the more modern designs. between the first 1911 appropriation of funds and eventual construction process that began in 1929 the quarrymen chose the stone for the building's exterior columns and interior trim. The Capitol was dedicated Feb. 2, 1931, in time for 10th Territorial Legislative session which convened March 2, 1931, under Gov. George Parks. The historic marble will grace that public building for many more years to come. If Juneau's Capitol Planning Commission succeeds in its endeavor to build a new Capitol, the old building can be renovated, restored to its original grandeur, and used for many other State of Alaska purposes.